Convert and compress MOD recordings shot by camcorders(JVC, Panasonic, Sony). Deinterlace, remove image noises, trim, crop, and more. Besides converting MOD files, the HD Video Converter can encode MTS, MXF, MOV and AVI camera clips as well as TiVo recordings. 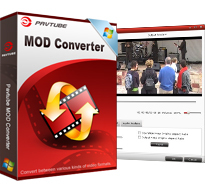 Pavtube MOD Converter is an ideal tool for people who are using digital camcorders like JVC Everio, Canon FS100 and Panasonic D-Snap SD-card camcorders. It can edit and convert the recorded MOD videos from your digital camcorder to other popular video and audio formats like MP4, 3GP, AVI, MPG, MPEG-4, FLV, MOV, 3G2, VOB, MP3, FLAC, MKA, OGG, WAV, AC3, M4A etc. for playback on portable devices like iPod, iPhone, iPhone 4, iPad, PSP, Zune, Creative Zen, cell phones and edit in Adobe Premiere, Sony Vegas, Power Director etc. The program's intuitive interface provides you the easy to understand options, with which you can use the MOD convert as an expert. Its optimized multi-thread technology allows you to convert MOD in a faster way, saving you nearly half time. The program adopted advanced audio and video sync technology, which helps to output video with high quality, never let you troubled by the audio and video issues. You can cut off the black edges and unwanted MOD video area easily with its crop function, so as to enjoy wider screen on the portable devices. - Fixed occasional crashes and some bugs. - A redesigned GUI (Graphical User Interface), which is more user-friendly and in-style. - Added support for CUDA acceleration in the availability of a NVIDIA CUDA enabled graphics card. - Optimized video and audio presets for Apple iOS 4.3 devices. - Added optimized H.264 video format for Motorola Droid X. - The performance of audio and video synchronization has been improved.